Interview with Jerry (2001) with Burt Feintuch. Memories & Reflections from Alyssa Miller, one of Jerry's young fiddle students. 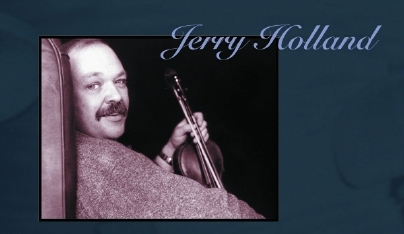 If you would like the Winter 2010 issue of Fiddler Magazine, which includes a Tribute to Jerry Holland article, with previously unpublished Jerry Tunes and photos, visit www.fiddle.com to order or subscribe. Jerry passed away in June 2009 at age 54. 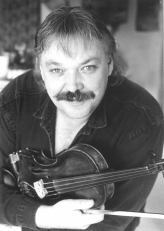 One of the finest Celtic fiddlers ever to record, Jerry came by his music honestly. His father was a musical man respectful of tradition. Jerry senior was over 50 when Jerry was born and this placed the budding musician directly into a vibrant older culture. From childhood on, a series of fortunate events put young Jerry in the company of many of the greatest Cape Breton musicians of the last generation - -Winston Fitzgerald, Bill Lamey, Angus Chisholm and several other less well-known fiddlers. Jerry Senior also had an interest in Irish music and he passed on repertoire to Jerry, including music learned from the 78s of Coleman, Morrison, Killoran, and Cape Breton fiddler Johnny Wilmot. For the last 35 years of his life, Jerry lived in Cape Breton surrounded by people who know and love the music. An emotional performer, his concerts and recordings were always memorable. During his lifetime Jerry published two books of traditional and original music - these included the majority of his compositions.